While other students were racing to grab something to eat before hustling to their next class, Johnny Martin, 24, stood alone to occupy Hayden Lawn following what he perceived as injustice in the wake of the Charlottesville riot in Virginia. 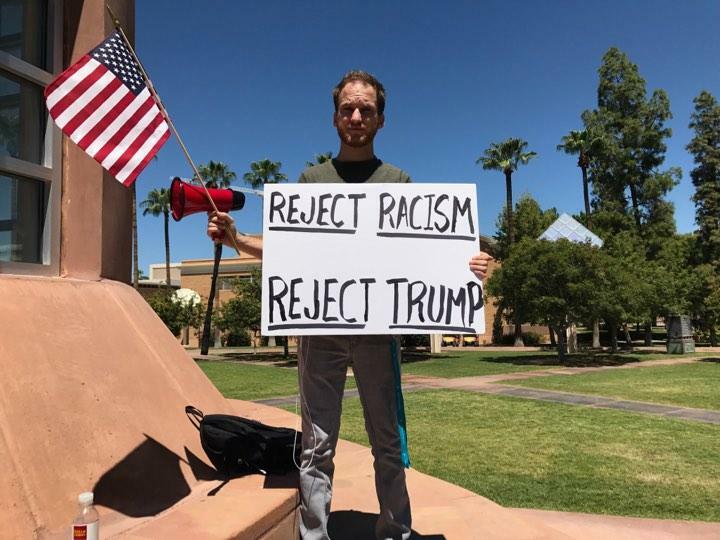 Martin, a religious studies major at Arizona State, has launched a one-person war against racism and intolerance on Hayden Lawn between classes. He currently has his sights set on fighting against the intolerance he believes exist in the Trump Administration. The Tab spoke to Martin concerning his views about the president’s response to the riot and why he felt pushed to protest. Martin also addresses the president’s inflammatory campaigning style as a key element in stoking the flames of racism across the nation. “I hold the Republican party responsible for the death of Heather Heyer.” Heather Heyer was hit and killed by a car driven by James Alex Fields, an alleged white supremacist during the protest. According to Martin, the Republican party is attempting to pass legislature to "protect people who run over protestors with their cars." Martin has been attending ASU for several years and even gained reputation as “the blue hat guy” after continuously counter protesting Brother Dean, a well-known Trump supporter and hate preacher. Although he protest alone, Martin believes addressing racism not only nationally but on ASU’s campus is important. When he found out about the alt-right posters a freshman student’s mom found on campus, he was energized to protest again. Many ASU students have shown their support by providing him with water and even engaging in positive conversation with him while he is protesting. Martin is currently running for office in Mesa for Arizona’s house of representatives for district 25. He also plans to continue his protest between classes and organization meetings.